October meeting | Crowlas & Ludgvan W.I. Despite the end-of-summer flu striking down some of our members, Murley Hall was full and buzzy at last night’s meeting. We welcomed four new members – Gill O’Connor, Rosemary Western, Sue Eames and Liz Hosking – putting our numbers now over the 50 mark! Crowlas & Ludgvan is growing! If you haven’t yet met our new members, make a point of introducing yourself and getting to know them at our next meeting. 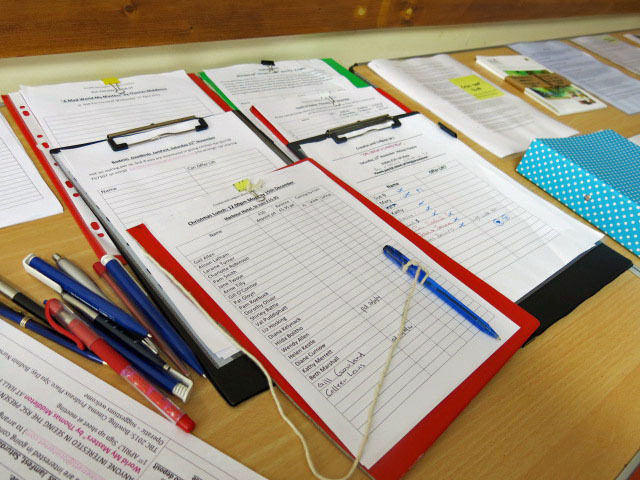 Just to show how busy we are, here’s a picture of our activity table and the line-up of signing in sheets. We think Kathy’s cornered the market on clipboards! Last night’s speaker, Inspector Jean Phillips of Devon & Cornwall Police, spoke to us about personal safety. She gave us a lot of great tips on staying safe – including using indoor bank machines and putting handbags in the bottom of shopping trolleys. She also told us about the scary new telephone ‘courier scams’ which are becoming more widespread. You can read more about them here on the Metropolitan Police website. Jean also brought with her Mary Shead, the district Neighborhood Watch representative for Penwith. Mary explained what her job entails and shared her insights with us about the value of local neighborhood watch organisations. I think more than a few of us are interested in starting up groups in our own areas! Our safety slogan competition was won by Helen Kestle, with Kathy Merrett second and Colleen Lewis third. It was a good night for Colleen as she also won Flower of the Month! Thanks to tea hostesses Pat Adams, Colleen Lewis and Polly Little. And thanks everyone, as always, for making it such a lively and fun meeting! Happy and healthy vibes go out to those of you who were under the weather and unable to be there last night.